Something for the model maker! 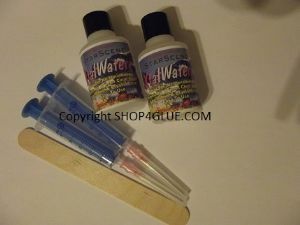 This amazing product is formulated for the modeller, designed to create scenic water effects in any type of model making. Ideal for creating realistic water such as ponds, lakes, rivers , water in household use such as glasses of drink, sinks and baths. Simple to use , supplied with mixing kit of mixing stick, syringes and blunt needles.